This image, distributed by RockBridge Capital LLC and New Castle Hotels & Resorts, depicts the developers' latest proposal for redeveloping Portland's Congress Square Plaza. The plan would include using nearly 10,000 square feet of the plaza as event space for the renovated Eastland Park Hotel and leaving another 4,800 square feet as public gathering space. 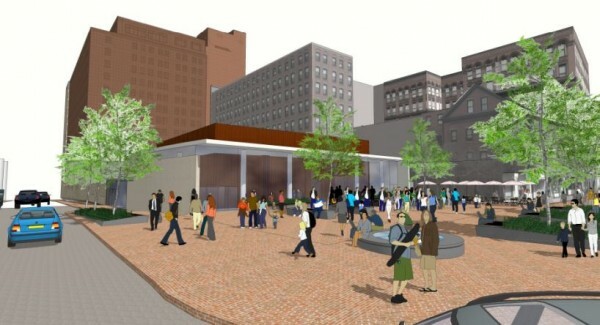 PORTLAND, Maine — A plan to redevelop Congress Square Plaza into event space for the incoming Westin Portland Harborview Hotel has been divisive. Consensus is easier to come by concerning the streets that pass by. The intersection of High Street, a thoroughfare that pipes heavy commuter traffic from South Portland to Interstate 295, and Congress Street creates a busy traffic confluence. Renewed interest in the area — a result of the plaza redevelopment proposal, in which developers of the neighboring hotel want to acquire nearly 10,000 square feet of the park for use as enclosed event space — has given birth to a new idea for the crossroads nearby. “I think there’s pretty strong agreement that the traffic situation through that square is awful, and needs to be altered,” said David Levi, who is opening Vinland restaurant on Congress Street this fall. “The woonerf idea seems to have a lot of traction, which is pleasantly surprising,” said Levi. The plan by Ohio-based RockBridge Capital, LLC, and its partners for redevelopment of Congress Square Plaza, on the north corner of the intersection, remains mired in a tug-of-war. Some believe the proposal is the area’s best chance for revitalization after years of underuse, while others say giving public space up to private interests sets a dangerous precedent. Among those in support of the plan are the Portland Community Chamber, whose board voted last week to endorse it. Representatives of the city’s Public Art Committee and the Parkside and Bayside neighborhood associations have spoken out against the proposal. RockBridge and the Connecticut-based New Castle Hotels & Resorts purchased the 86-year-old Eastland Park Hotel two years ago and the firms are in the middle of a $40 million renovation of the landmark building, which will reopen as the Westin Portland Harborview Hotel in December. Developers hope to take over 10,000 square feet of the adjacent 15,000-square-foot Congress Square Plaza for gallery and event space. The current redevelopment proposal, which has been revised several times in two years, leaves 4,800 square feet of space for continued public use. That’s more than twice as large as the New York City Public Plaza Standards guidelines, often cited by city officials as a reference point, and is greater than the 3,000-square-foot Longfellow Plaza a few blocks away. On Wednesday night, after three hours of debate, a city Congress Square Redesign Study Group deadlocked on whether or not to endorse the latest version of the RockBridge proposal. Next, the city council’s Housing and Community Development Committee needs to decide whether to endorse a sale of a portion Congress Square Plaza to the developers. The committee meets next Wednesday. Some stakeholders, unsure about the plaza redevelopment, say they could get behind the project if it’s part of a larger transformation of the intersection. As a woonerf, the streets and sidewalks in the area would be made level, street signs and traffic lights would be removed and pedestrians would be given free reign to walk from Congress Square across to the Portland Museum of Art and to the nearby State Theatre, restaurateur Levi said. Although vehicles would be allowed to travel through the woonerf, he said, they would do so at slower speeds. Cars will be encouraged to use side roads and alternative parallel streets to make the area pedestrian-friendly. “In other places where they’ve been implemented, drivers will avoid these woonerfs when they can, and when they can’t, they drive with extreme caution,” said Levi. While it’s unclear how much creating a woonerf at the intersection would cost, Wennerstrom said the hotel developers would be an “active player” in raising the money for the work. Correction: An earlier version of this story reported that the intersection of High Street, a thoroughfare that pipes heavy commuter traffic from South Portland to Interstate 205, and Congress Street creates a busy traffic confluence. It is Interstate 295.